Yamaha THR10 vs THR10C guitar AMP, which one should you pick? Every guitarist needs an amplifier, but it’s not easy to find the best one. Many of them stuck in the dilemma of choice: Yamaha’s THR10 vs THR10C. The two amp sims are somewhat identical, even in terms of price. But they are distinct products, and choosing the wrong one can cost a user’s fortune. Therefore, we come up to a comparison and guide to let you decide which one suits you the most. In 2011, Yamaha has introduced a series of guitar amplifier simulations for guitar. The series soon caught a lot of attention and love due to its stylish design and impressive usefulness. The series consists of 5 different amplifiers, with THR10 is the first and original member. Succeeded to the THR10, Yamaha continued to release THR10C, THR5, THR10X, with each amp simulator aims for different purposes. Despite being the oldest, THR10 is not worse than its successors. In fact, it suits a great number of users and playstyles, making it the most popular choice in the series. As said, THR10 is the first model in the THR series, thus it introduces the general style of the entire family. It has a retro appearance with gold/sand color and a line of black knobs in the top. Every parts of the enclosure are made sleek to provide an elegant antique look. The THR10 weirdly resembles your grandpa’s old radio but without the long antenna. Having so many tiny technological devices around, you may feel an old radio is a bit clumsy. However, the THR10 is much more compact than many other amp sims in the market. It only weighs 6 pounds, just like a bowling ball. Other amp sims may force you to slide in 4 wheels in order to move. Meanwhile, the THR10 is a lot easier for you to carry along the way and perform a street performance. Or you take it to the park, put it next to you in the bench and start an improvisational play. Anyway, unless you’re into a professional music show, carrying a beautiful antique radio is often way better than pulling a big and heavy suitcase along. As you may think, with its compactness, the Yamaha’s THR10 isn’t suitable for professional stages. Home studios or average to small recording rooms are where the amp sim shines best. It is optimized to give home users the best music experiences that none of the cheap amp sims can do. The most impressive feature of THR10 is the simulation of 5 different amp models. This is done thanks to a Yamaha’s exclusive technology – Virtual Circuit Modeling. The signature technology allows the amp to simulate and make their circuit to work as one of another model. You are able to operate the THR10 as another famous real-world amp. These are very famous guitar amplifiers that are loved and pursued by hundreds of players. But acquiring all 5 different amps is a burden for your budget. In fact, there’s rarely any home user can possess all of the 5 above amp model at once. Therefore, the THR10 is a fantastic resolution. 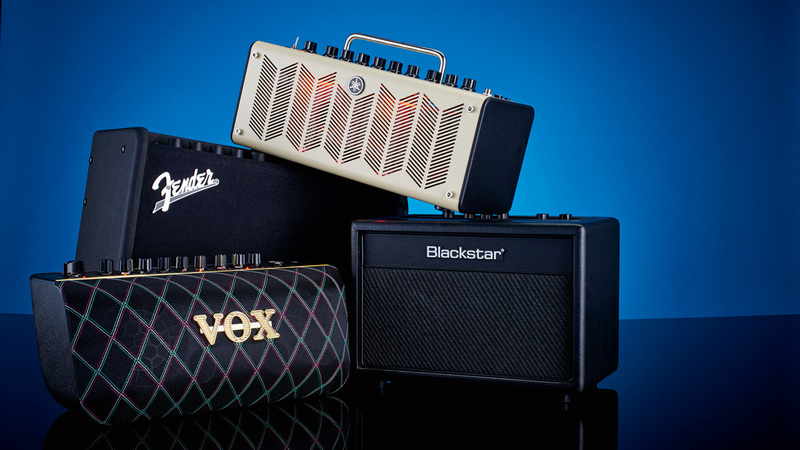 You can choose your favorite amp model to play and switch to another one whenever you want. It will be a lot helpful when you change song or song’s style or even your desired playstyle. Amp models can be easily changed by turn the biggest 8-position knob on the top of the amp sim. You can recognize it only by a quick look: it is covered by 2 curve lines of LED indicator and names. To the left, they are the 5 available amp model for you to choose. There is no pointer in the knob but when it’s turned, the LED indicator will light up to indicate which mode is being used. Moreover, to the right of this knob, there is still 3 amp model too – Bass, Aco (electro-acoustic), Flat. They are not simulations of real-world amps but rather amplifier presets. They are the most generous settings that fit a bunch of songs and playstyles. If you don’t have an idea which amp model or famous styles to play, just turn on one of them and play. Aside from the amp model knob, there are many other controls for the THR10. The simply line up on its top with no flashy decorations or lights as to fit the retro style of the amp. To the very left of the amp sim, there is a Power toggle and a short line of 5 user preset buttons. After hours of tweaking the effect, you can save them in these preset buttons for future using. There is a big LED indicator to let you know which preset is active, as well as the tempo rate of the song. Skipping the aforementioned amp model knob, you will have 5 adjustment knobs – Gain, Master, Bass, Middle, and Treble. Moreover, there are two effect controls that add distinct effect to your signals. And finally, there is a Guitar and a USB/AUX knob in the volume section, the former lets you adjust the level of guitar’s signal, while the latter is of the USB/AUX output. There is no complex control for the THR10, just turn any knob you want and feel the change in your song. If you want to rip off the effect and hear the dry signal, turn the amp model knob to the FLAT position. However, don’t underestimate the Yamaha’s THR10 because of its simplicity in design and controls. One thing you should remember about these modern guitar amplifiers or any other modern accessories is that they don’t work alone. The Yamaha’s THR10 comes with a smart and powerful computer program – Cubase AI. The Cubase AI is a designated program for the amp sim, you can install and use it only when owning and connecting to a THR10 amp. In the Cubase AI, you can find hundreds of preset tones and effects. You can mimic the play of some famous guitarists or mixing two or more of them to create your own. You just need to use your mouse to mix and adjust the signal rather than turning each knob left and right for hours. When having the ideal tone, you can save it to 1 of 100 slots in the THR10 for later use. Yamaha’s THR10 and the Cubase AI will help you create your unique music taste within a few ticks of the clock. With those fantastic features, especially the simulation of Britain High Gain, THR10 become the most successful one in the THR series. If needed to point out a negative thing of the THR10, it may be that more buzz, dirt when the volume is high. It’s reasonable because THR series is optimized for compactness and less extensive uses such as home studios or street performances. The THR10 is not perfect, it cannot fulfill every task and suit every user in the music world. Therefore, there is still a considerable amount of users fall in love with another member in the THR series: the THR10C. This is why we have the dramatic race: Yamaha THR10 vs THR10C. Regarding appearance, THR10C is just slightly different than the THR10 in color. THR10C has a dark blue satin finish, which makes it look like an antique blue 90s radio. The blue color somewhat indicates a feeling of emotional, tender and harmonic music tone. Other than the color, everything is similar to THR10. They are in the same amplifier series, they have the same price, and they use the same VCM technology. THR10C has just the same number of knobs and controls as the THR10. And it is also compatible with the Cubase AI recording program, you can create and store your favorite mix and then play it on the amp sim. As with THR10, you can also access the hidden features of Cubase AI, such as extreme compression and noise gate, etc. As brothers and sisters in the THR series, the C also incorporates another Yamaha’s exclusive technology: Extended Stereo Technology. This is a speaker design that creates dispersion and depth in stereo output. Extended Stereo Technology brings you a spacious, 3-D music experience that is only available in high-end loudspeakers and monitors. Besides that, the Yamaha’s award-winning AV Division ® Technology simultaneously process both guitar’s and track’s signal to provide the best tones as possible. The THR10C is also optimized for home studios, small recording rooms or convenient movement. Both of them runs on either 8 AA battery cells or an adapter. They also achieve 10-watt power and weigh relatively 6 pounds. So what is the difference between THR10C and the rest of the series? What makes it stand out as a distinct amplifier simulator? What makes some people fall in love with it instead of its impressive THR10 brother? It is about the blue, not the color but the tone. THR10C is more oriented to blues-genre music. The overall blue color of the amp implies this. The THR10C work best when you are playing blues and emotional songs. It simulates different amp models from that of the THR10 and other members. Those amp models are adjusted to fit the tone of the blues songs. Therefore, the THR10C doesn’t perform other genres of music as well as the others. In details, many people feel disappointed that the THR10C lacks support for the High Britain Gain model. This is one of the most common tones for heavy and metal songs but is excluded out of the amp sim. If you want to play more energy, more dirt, and peak in your songs, you should choose another amp. But if you love the tenderness and slowness of blues music, don’t hesitate to try a THR10C! They are all amp models that are optimized for blues music. But each other has a different tone, You need to try each model to know which one suits your playstyle. The THR10C also has 3 standard amp model: Bass, Aco, and Flat. In Flat mode, every effect and adjustment will be bypassed and you will listen to your dry signal. There is no such question as “Yamaha THR10 vs THR10C, which is the best?” In fact, each of them is designed for different tones and music genres. Look at amp models THR10C can simulate and you know that there will be no high gain when using it. But for a blues lover, you won’t need it. However, there is a tip if you love the THR10C but still want the high gain option: buy the THR10 and use pedals for achieving the blues’ tone. Meanwhile, THR10 can offer a more impressive boost for highs and peaks. Different music genres other than blues may also be benefited from THR10’s features. So, if you are more of a heavier or higher gain music, THR10 is a more suitable choice. But remember, besides THR10 and THR10C, there are other members in the THR series that are optimized for a particular genre of music. THR10 is truly useful only if you play lots of songs from lots of genres and styles. Musictoob.com is a participant in the Amazon Associates Program, an affiliate advertising program designed to provide a means for sites to earn advertising fees by advertising and linking to Amazon.com. Hi guys, I’m is Rikpak Lane who is a musican in California. Working in a small studio and writing blog bout music stuff is what I love now. There are some experience I feel that I need to share with you to choose the best studio gears to help learning to use & master that become not difficult anymore. © 2018 Music Toob. All Rights Reserved.